Every so often Jorge and I dive into the virtual newspaper and see if video game news is still weird and scary. Good news: it is! This week we talk about potential game to TV crossovers, the strange swamp of well-funded nostalgia is Kickstarter, and our dearly departed P.T. Jump into the comments with your ideal animal adventure duo. How about a badger and a fish? 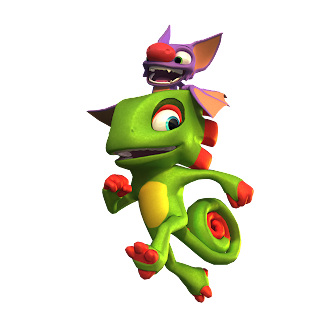 I disagree that Yooka-Laylee's success is driven mostly by nostalgia. (Full disclosure: I did back it myself, so I may be biased). I mean, it's cute that the character design has similarity with Banjo-Kazooie, but I am much more interested that it's a free-wander 3d platformer developed by a team with a strong track record there; I want to see what they can do given free reign in a mostly fallow genre with modern tools and sensibility. If they end up just turning out Banjo-Kazooie HD, I'll be disappointed. Yea, I think Scott made a very similar point. It's not like we have a slew of 3D platformers to choose from. I still wonder if they wouldn't be better served by accepting patronage in other ways than Kickstarter. It sounds like you'd back them blind, which I is really what they want to some from fans, right? Also -- truth drop - I never played Myst for more than ten minutes. But I still remember what it looked like. Also, I liked what you said about the possible Myst TV show, and the hopes for something good. I think of shows like American Horror Story, where each story is one season long. I'm really glad TV has been trending in these more robust ways. As a Gen X/Y cusper, the TV today is what I was *begging* for when I was a teenager and lived inside the TV. Kids these days don't know what they have. It's basically the Ico of TV-based games.